Join the Sarod maestros Amaan and Ayaan Ali Bangash, for a melodious evening when they present you ‘Infinite hope’, a fusion masterpiece. The brothers, known for their mastery of the instrument, Sarod, will be performing live. 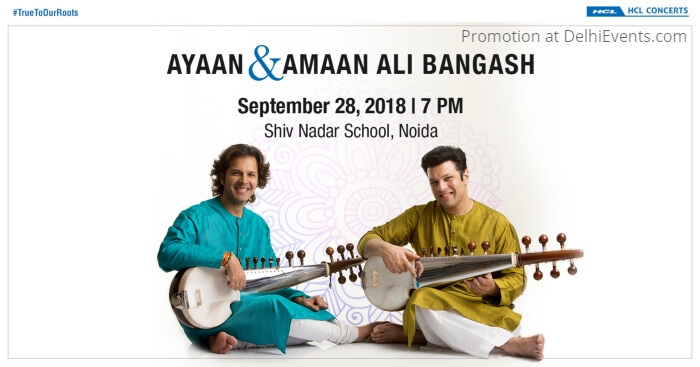 Trained by the legendary Ustad Amjad Ali Khan, and forged from a unique artistic vision, Amaan Ali and Ayaan Ali today represent the 7th generation of an incomparable musical lineage. About the Organization : HCL Concerts is a pioneering initiative by HCL, encouraging Indian classical performing arts for more than two decades.